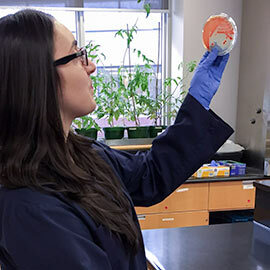 To say that Gabi Micheli, a fourth-year honours biology student at Laurier, leads a busy life would be an understatement. Between juggling a full senior course load, mentoring first-year Arts students, job shadowing a local physician, volunteering at a local hospital, and conducting research in the lab – there is barely time for her to catch her breath. But Micheli wouldn’t have it any other way. She’s living an active and engaged student life and loving every minute of it. A Kitchener native, Micheli attended one of the city’s largest high schools. When the time came to consider post-secondary options, she knew she wanted a school with an excellent academic reputation and a strong sense of community. Micheli’s undergraduate experience has been academically and personally rewarding – something she attributes to Laurier’s dynamic professors and the comfortable campus environment. Micheli is currently working with DeWitte-Orr in her research lab as part of a Faculty of Science Students Association (FOSSA) Research Assistant Scholarship (RAS). The RASs provide students with funding to conduct research alongside Laurier faculty members. Micheli’s work includes investigating receptor proteins to understand their role in viral infections. Micheli will be working with a graduate student in Slawson’s lab during the winter term, where she will be isolating and culturing salmonella from environmental samples. “Hands-on lab experience really gives you an inside look into some possible career paths in the sciences,” said Micheli. Micheli is looking ahead to her career options and planning the best way to make her dream of attending medical school a reality. While an additional year of undergraduate studies would allow her to explore courses to complement her degree, she acknowledges that graduate work could also give her a competitive edge. Regardless of her plans for fall 2016, one thing is clear for Micheli – she wouldn’t be where she is now if she hadn’t come to Laurier. Visit the programs page for more information on Laurier’s science programs.